To be cost-effective, these applications need to be compact and require a minimum of maintenance, but there is also an urgent need for these to contribute to increased safety for operators. To meet these demands, HCH offers a wide range of high reliable bearings. For improved cost-effectiveness, the HCH bearings are maintenance-free and facilitate downsizing. > HCH high quality, ultra clean steel material can improve bearings’ liability further than customers’ expectation. > HCH synthetic grease with multi-temperature function further strengthen the bearing reliability in different working environment. > HCH bearings with special designed sealing structure with three sealing lips for better dust preventing function. > HCH customized clearance selection system guarantees the bearing’s high efficiency and prevent bearings from creep. > Carry the vehicle mass. > Ensure contact between the tyre and the road. > Isolate the chassis from the disturbances created by the interface between tyre and road. > Guide the wheel in its displacement. Bearings under vehicles’ suspension system are usually under very high loads and in very harsh environment especially when the vehicles are on the muddy or dusty road. 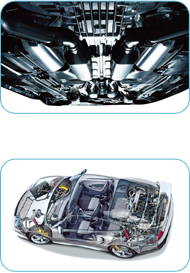 Working with world famous automotive manufactures, HCH has abundant experience of bearings for suspension. We highly understand the customers’ demands on high reliability, low friction, and dust preventing products. HCH’s engineering resources and consulting services can help the design engineer improve the overall functionality of suspension. Bearing applications in chassis and attachments are commonly exposed to heavy loads, often in rough working conditions. HCH bearings are designed for tough working environments and also offer minimal environmental impact.